Bring out the creative flair in you, use every day articles to make a gadget. A gadget made by you can be a unique gift option too. Try out building some stuff and have fun while doing it yourself. A flat piece of wood and furniture knobs is just the things you need for this task. Simply drill equidistant holes in the piece of wood so that the furniture knobs can be screwed in. You can either use identical knobs or different ones. The piece of wood can be painted or polished as per your choice. 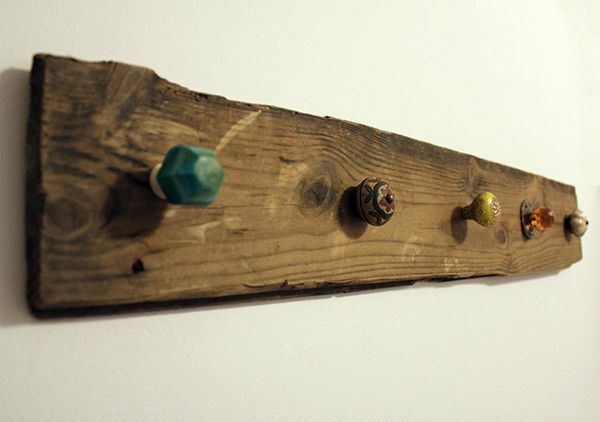 Hang the flat wooden piece with furniture knobs on it, on the wall, and your necklace holder is ready to be used. Old magazines in your house can be stacked to form a sitting stool. 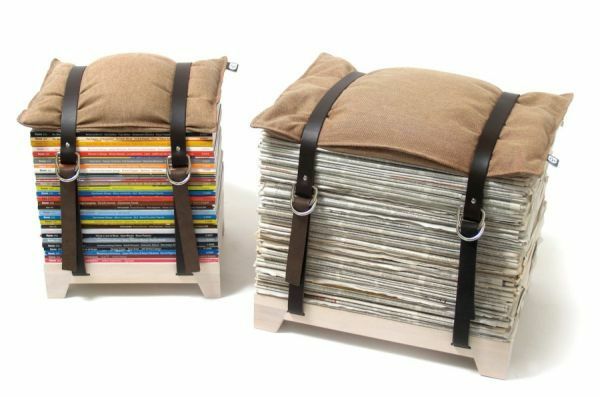 Take around 25 to 30 old same size magazines, a same size pillow and two belts. Stack the magazines in a pile, place the pillow on top and use the belts to hold the bundle together. Another option is to place a wooden board with feet at the bottom of the magazine stack and then tie the belts around. Wondering what to do with the pile of old cassettes stacked at home, here is a simply gadget that you can make out of it. Take four cassettes, a small cardboard piece to make the base and a glue gun to stick the tapes together. First, cut the extensions from one side of the cassettes, which guide cassettes in the player. 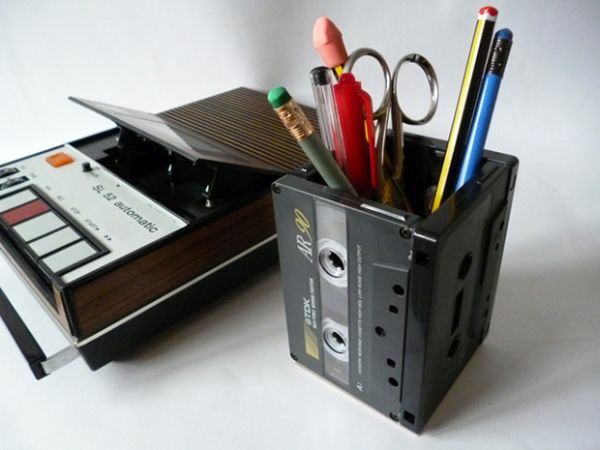 Use the glue gun to stick the cassettes to make a box and stick the cardboard piece at their base and your cassette tape pencil holder is good to use. 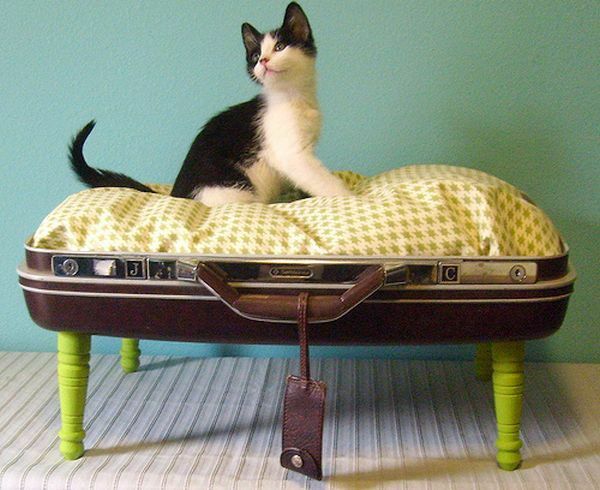 Pamper your pet with a homemade suitcase bed, custom built by you. Take an old suitcase lying around your home, remove the top of the suitcase. Drill a hole at four corners of the base and measure the inside for laying the bed. Take four wooden blocks and screw them at the base of the suitcase to make the legs of the bed. Place cushions inside the suitcase and allow your pet to doze off in comfort. There is an extraordinary sense of satisfaction in a DIY project, also you can boost around to your friends about the gadget you built.